This bag is a good size to carry a water bottle and a sandwich, which is what I use it for. We ordered them as a promotional giveaway for a trade show, and I personally have a lot of use for the cooler bag. I suggest this model CR3. My colleagues and I receive the best customer service from custom earth promos, this is why we continually use them. Cool bags, I wish I could upload a picture of our finished product to show you how great they came out. I highly recommend using this bag in the lime green color. Pretty cool eco-friendly bags that have been a great benefit to our marketing campaign and company. Such a great product. We get so much business exposure from these bags! Such an inexpensive way to promote our business. I'm so glad we found Custom Earth Promos. Our clients absolutely love these bags! They use them all the time and our business gets endless promotion! Such a great product for our marketing team! These bags are extremely high quality and very attractive! Durable and high functioning! Thank you! Great for all of us on the go. These cooler bags really are nice to have around. Maintaining an eco-friendly awareness is key as well, and these allow us to do so. Customizing these eco-friendly cooler bags for our school district was a great idea. I was able to use our school colors for the bag. The whole project left me with a great feeling. sturdy and able to be reused time and time again, I clean the inside of the bag and it always comes out clean. We couldn't be happier with our bags! They maintain internal temperature for hours while looking great! I customized these snack cooler bags for all my kindergarteners. It was a great way me to provide a useful item. More importantly I was able to use the bags a an example as to how helping our environment is so important. A huge asset to our camp and earth-friendly mentality. The non woven poly material is great for reusable bags I have ordered several different models from them of this material. These bags are durable and visually appealing. Plus they keep out food hot forever! Great way to spend some money on your employees, they love em and use em every day. Couldn't ask for a better company to work with. The line of communication was far superior to any other company I have worked with in the past. I love the nice long handles, makes it very easy to carry. The imprint area is just the right size and is of good quality. The zipper works well I have not had a problem with it getting stuck at all. The overall size of the bag is perfect also. I would recommend this reusable bag. I love all the colors that they offer for this cooler bag, we choose pink and royal blue options for our maternity store. We figured the bag is perfect for mothers to use to carry milk bottles in being that the bag is a good insulator. All of the parents/customers that we have love the bag. I would reorder this bag for sure. Ordered this bag on there website, very simple process then I followed up with a call and there customer service person was able to do a rush on my order and expedite the delivery. I received all 10,000 of my bags in good condition the way I wanted them. I would use this company again for a reusable bag order. Really impressed with the quality of these bags! Such a great way to put our business out there! This is the perfect promotional product. We get great business exposure from these bags! Very good insulator, I received this bag from my company, I now use it every day to carry my lunch to work in. Always keeps my food cold even on a very long commute on the train. Very affordable at bulk quantities. Well made bag, we were very happy to partner with custom earth promos on our reusable bag venture. They were excellent throughout the whole process. We are looking forward to the next order with them. Perfect cooler bag to giveaway for my company. We are a fresh foods supplier and at our recent industry conference we handed these out as a advertising and promotional tool, it was a success. I am a marketing exec, and have used custom earth promos now for several years. The reusable bags that they offer are always well made and we are confident in putting our brand logo image on there bags. The reusable bag is such a good marketing tool as everyone gets to see it every time it is used. For the price that it is sold at, it truly is an invaluable tool to purchase for your company. I recommend the seller and the bags, both are great. the zipper enclosure works well and the side pocket is useful, very good lunch bag all of my co-workers use them an it in turn makes us a more eco-friendly company. 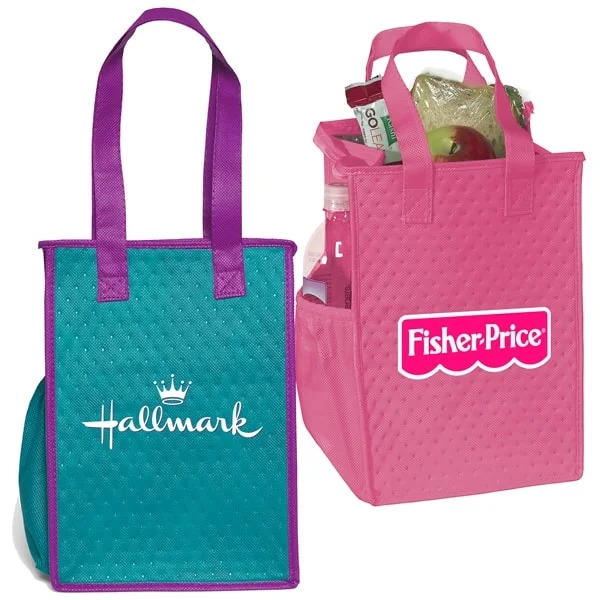 The Promotional Snack Cooler Bag comes in a wide variety of vibrant colors that will compliment your brand name and logo, while helping the environment with it's reusable and recyclable design! Custom Earth Promos is happy to present durable and practical reusable bags to suit your advertising needs! When you use our insulated bags for giveaways, you can show your customers that you make eco-responsible choices, while promoting your business at the same time. No matter what industry you're in, these bags can be custom designed to suit the promotions for any type of business! Our highly-trained design experts will work with you through every step of the production process to make sure that your brand gets maximum exposure and recognition! Our conveniently sized reusable bags are available in 11 vibrant colors: Black, Brite Pink, Grape, Hunter Green, Khaki, Lime, Navy Blue, Orange, Red, Royal Blue & Teal. The 5" W x 7" H imprint area of these bags will make sure that your custom message is noticeable wherever your customers carry them. Made from premium-quality, non-woven polypropylene, the bags are also durable enough to carry heavy items for long periods of time, and the plastic bottom insert provides extra support.Your customers can use our bags for multiple purposes, especially for lunch and picnics, because the insulated lining maintains the temperature of both hot and cold food items for hours! These bags also include a side gusset pocket of 7" D, which offers additional carrying convenience. The dual reinforced carry handles are 18" long, and can easily be adjusted. And to ensure your customers' health, we test all our products according to the California Proposition 65 guidelines. Our overseas factory ensures that even large quantity orders are fulfilled according to the exact client specifications. Your order of Promotional Snack Cooler Bags can be customized with imprints of creative messages and stylish designs. We have an extensive collection of stock graphics and images to choose from, and our premium printing equipment imprints these eye-catching designs in high-resolution. Custom Earth Promos' design team makes sure that each order is crafted quickly, while maintaining the high-quality standards to produce impressive results. And since we supply our products straight from the factory, so we have the best wholesale prices in the industry!